In 2018, 85% of B2B marketers reported that improving lead generation conversions are their most important content marketing goal. Before you can even think about attracting those leads, however, you need to have an effective lead magnet. If you aren’t familiar, a lead magnet is simply an incentive that you offer your target audience in exchange for their email and/or other contact information. However, a lot of people create an ineffective lead magnet, gate it behind a landing page and expect people to find them. And most of the time they are underwhelmed with the quality and quantity of leads they generate. In fact, only 1 in 10 marketers reported that their lead generation efforts are highly effective and efficient! Now if you want to attract quality leads to a lead magnet you’re going to need to create a few supporting visuals. These visuals help you bring people to that landing page or blog post and gives them a reason to provide something thing that’s very precious and private to them, their email or phone number. Like an infographic that summarizes a section of an ebook. A chart that breaks down one of your important findings. Or even a gif on social media that features a section of your webinar. All of these visuals are used to ensure the leads you get are the leads you want. If you're not sure how to use each of those in your lead generation campaigns, you are in the right spot! As someone who works for an infographic company, it makes sense to start the article with infographics. Especially because they are often overlooked in lead gen strategies. However, they may be the most powerful supporting graphic you could create! Don’t believe me? Well, let’s take a look at a few ways you can use infographics to acquire better leads. In the infographic example, we visually summarized a lot of the key metrics from a social media case study. We made it easy to digest but didn’t reveal all of our findings just yet. Plus, people are already very familiar with infographics, so they can quickly read or interact with them. Making things easy for your readers will definitely help improve lead gen conversions. I think this is a great approach because it instantly shows the reader what they are going to find in the ebook. Plus, the name recognition of some of those experts will hopefully push people to convert. Using an infographic as a supporting graphic will not only get potential leads excited about the lead magnet, it will also weed out the bad leads. Because as you know, not all leads are created equally. 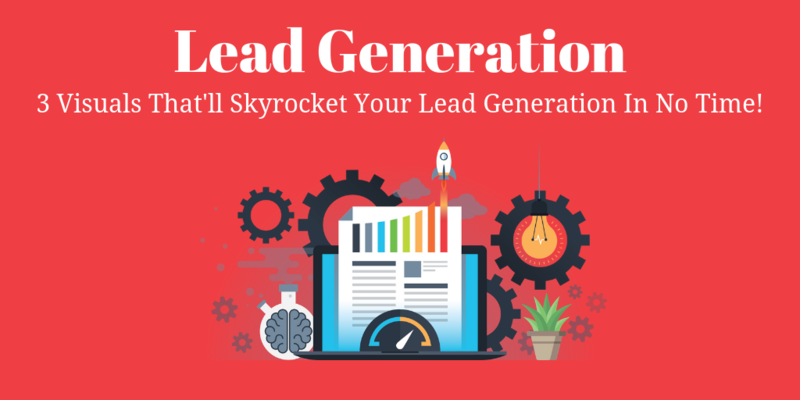 Now I’m guessing you would rather avoid the bad lead generation from the beginning, as opposed to investing time into nurturing leads that will never convert. Like in this infographic, you may not get a ton of people excited to read about how social media and SEO intersect. But the people that really do care, will turn out to be solid leads. So use some infographics like we outlined above to attract the right people for your business. You can place an infographic like this on a blog post, a landing page or send it out in an email. Additionally, infographics can be easily shared on social media which make them great supporting graphics. Your infographic will definitely stand out a lot more than a simple blog header. It might even get picked up by an influencer in your industry, further increasing the reach of your lead magnet. Charts and graphs are like the younger siblings of infographics. That said, they can be just as effective as an infographic and take less time to create. Like an infographic, these will do very well on social media. And these can be embedded in other articles, which brings additional traffic to your lead magnet. If you are wanting your landing page to rank on Google, creating these supporting graphs is an easy way to grab some links as well. This will ensure people see them first, and get instantly pulled into your lead generation funnel! People may know your topic is important but until they see some data, like above, they may not care enough to act. These simple graphs, which took us a few minutes to create, helped make a great case for each lead magnet. And like I said above, these images can easily be shared on social media. Taking us to our next point quite nicely! One of my favorite supporting graphics, that do well on social media, would have to be the quote graphics. These simple, but extremely powerful, images can quickly bring a lot of attention to your content. Plus, you can hack the influence of these people and expand your potential audience almost instantly. This is a lead generation tactic I have used many times before to grow my following. Just try not to be spammy with your shares, or it may have the opposite effect. This example pulls an important finding from your ebook or report and makes it visually appealing. And it gives your followers a little insight into what they will be learning from your lead magnet. A simple Tweet or share with that same information would not catch a reader’s eye. But the instant you turn it into a graphic, it stands out like a sore thumb. But since I devoted an entire section to these examples, let’s quickly move on to GIFs! As you probably know, GIFs are literally everywhere on social media these days. However, most of those GIFs are from TV shows or movies. These motion graphics will definitely stand out from all the other images on social media. And draw some eyes to your landing page in no time. Ryan McCready went to the University of Arkansas and graduated with a degree in economics and international business. Now instead of studying the economy he writes about everything and enjoys stirring the pot.